PADI Master Instructor, NAUI Scuba Instructor, Acuc Instructor, Iantd Instructor, CMAS Instructor, UDT Instructor, Coast Guard Instructor, Safe Boating Instructor, Scuba Equipment Factory Trained Service Specialist, Life Support OEM Manufacturer, Ontario Certified Commercial Diving - Supervisor, - Diver, - Trainer, ships Master and Captain, Salvage Master and Scuba MacGyver (MacDiver). Oakville Divers Experienced Master Scuba Instructor Robert Shannon has been working full-time as a Professional Master Scuba Diver Since 1979, before that he was working as a diver in his family's Scuba Diving Shops, Commercial Diving Operations, Dive Charters from the age of six a true second generation professional diver. 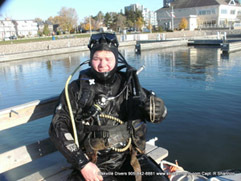 No Diver or scuba shop has the hands on in-depth full time dive experience of our Oakville Diver Robert Shannon. The only professional divers who can make that challenge are his brothers who own their own three scuba shops and various related businesses. Robert's parents Todd and Jeanette kept the family together traveling, scuba diving, boat cruising, camping, and family scuba dive shop est. 1963 . Robert has since opened Oakville Divers Scuba Shop as a premium dive center with all the dive facilities within a short walk of Historic Downtown Oakville for the last 25 years. Todd and Jeanette started Roberts Dive training early as the youngest he accompanied Todd and Jeanette on every dive , scuba course, professional dive show , scuba Instructors course. Many Family stories of that time have younger Robert running dive boats, going over student divers gear, being a dive master , making lead weights , tumbling tanks , learning to service dive gear. and trying to convince him to fill scuba tanks. Mr. Shannon has decades of in depth experience in all things related to Scuba Diving -safety- diving instruction, servicing certifications for every major brand of scuba gear, commercial diving equipment and all related underwater activities. Robert Shannon is also the "Go to" " Can do" dive professional for all things Hollywood North Toronto involving stunts safety, boats, underwater cameras, safety, water and ice for film, media and TV productions. He is also involved in many other forms of media such as independent film, TV Commercials, Industrial Film, educational film, Imax and Discovery. In his spare time Robert likes to look for ship wrecks, develop new safe diving sites and experiences for all divers to share. If you need a hand to feel more confident and safer underwater join him on his local dives and dive vacations. PADI Divemaster, Co-coordinator for Oakville Divers Toronto Hollywood North Film Productions, Oakville Divers Commercial Sales Division, Expert Lady's wetsuit and equipment of choice fitter, Oakville Divers "Master of Everything"
Julie has been working in the dive industry, and with the Shannon family, for over 15 years. An avid boater and "adventure" sports enthusiast from a young age, it was a natural fit for Julie to find her way to the diving world. Always willing to go the extra mile for a customer, Julie runs the "whole show" at Oakville Divers, keeping the shop and the dive training running smoothly (and often having to keep that Shannon boy in line). Following a successful career in the marketing and PR industry, Julie returned to Oakville Divers after the arrival of her daughter. Proving that Oakville Divers is a "family business" as well as a "family friendly" business, Julie often has her 4 year old daughter hanging out in the shop (she is one tough sales staff!) and is also God-Mother to the other mini diver that runs around the shop. Julie is also in charge of our Oakville Divers Commercial Sales Division and Co-coordinator for Oakville Divers Toronto Hollywood North Film and Media Production. As you dive more you will meet the extended Oakville Divers Team and Crew a Large group of Dive Experience who share Roberts friendship , Diving Philosophy, Rules of Dive Safety First, Dive for Fun and new Adventures.